Cloudy with occasional rain late. Thunder possible. Low 62F. Winds SSE at 10 to 15 mph. Chance of rain 100%. On Tuesday, April 9, 2019 Bell County Deputy Patrick Brooks executed an arrest warrant on 36 year old Danny E. Mason of Pineville. Deputy Brooks states in the complaint warrant that on January 11, 2019 Mason entered the Ferndale apartment of Tasha M. Cox and stole items valued in excess of $2,000. 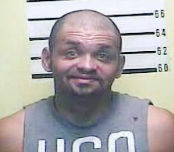 Mason was charged with Burglary 2nd degree and lodged in the Bell County Detention Center. He was released from custody on April 11, 2019 on bond.